bookitgreen enables you to book sustainable holiday accommodations easily online. Travel #samebutgreen. bookitgreen enables travellers to rent out and book sustainable holiday accommodations worldwide in a few clicks on a transparent booking platform that represents their values. You can book everything from organic farm-stays and luxury ecolodges to urban flats and travel #samebutgreen. Is sustainability in everyday life important to you? Book with bookitgreen holiday accommodations that suit your own lifestyle. Next time you travel, bookitgreen! That would be a great start for us! We could integrate our payment service provider, put a new search page online and display guest ratings. Achieving this second goal would make it possible to complete all the technical developments planned for this year and add many new hosts to bookitgreen. Our vision is to make sustainable holiday accommodations worlwide bookable on one easy to use online platform. At the beginning of 2018, we launched our booking functionality and have since been able to convince more than 750 holiday homes of bookitgreen. Over 1,000 booking requests have already been processed via our system and in the first year we have managed to show that the bookitgreen concept works and can be further developed. Many things are not yet technically working as the guests and hosts would like them to. That's why we're now looking forward to your support in order to be able to tackle the necessary further developments with new resources. 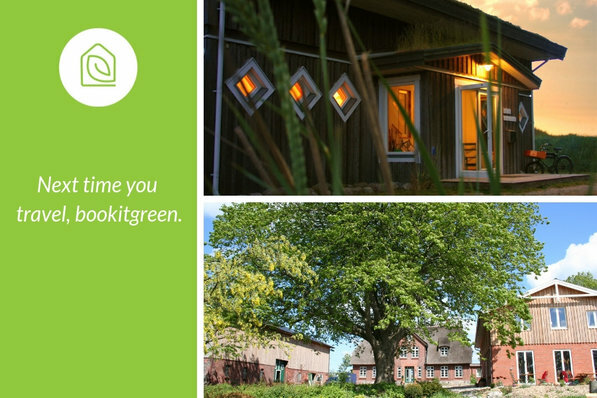 If holiday homes have such a certificate (from external certification bodies), we present it on bookitgreen. In addition, the hosts provide information on which of our 15 sustainability criteria they meet. These range from renewable energy and organic food to the use of ecological cleaning agents. Depending on how many of these criteria are met, the accommodation receives 1-5 green leaves as a simple indicator for the guests. After their stay, all guests have the opportunity to assess the sustainability of the accommodation. It is particularly important whether the information provided by the hosts is correct and comprehensible. If they are not, the accommodation will be excluded from bookitgreen. This way we try to present a holistic picture of the sustainability of holiday accommodation, in which hosts, guests and certifiers can have a say. For each night booked, we plant a tree with our partner Eden Reforestation Projects. We were able to win Dr. Eckart von Hirschhausen (German bestselling author, moderator and comedian) for the interview because he is a keen advocate of sustainability and the environment. He is already an active ambassador for Atmosfair. Nowadays travelers want to book online with a functionality and booking experience that matches techincal standards of the 21st century. This also applies to sustainable holiday accommodation and holidays. Unfortunately, there is still no platform worldwide with an extensive range of sustainable accommodation that can be easily booked online. We want to close this gap with bookitgreen. With bookitgreen we are addressing people who pay attention to sustainability in their everyday lives and would like toexperience the associated values when being on vacation. Together with you we want to create opportunities to travel the world more sustainable. With your support we can further develop the platform, add many new sustainable hosts and attract more vacationers with our offer. For every euro you invest in bookitgreen, we get another 50 cents from already existing grants. Your support counts from the first Euro! In addition to bookitgreen products, we offer you samebutgreen travel products as rewards. There is something great for everyone. A completely new bookitgreen style search page,(corresponding to the main and detail pages) with better functionality and usability. The search for specific holiday accommodations is then possible. Technical integration of our payment service provider: Currently, guests still have to make two transfers (deposit and balance payment) to book their holiday. Our goal is to integrate a payment service provider with which we can process the payment in an uncomplicated way. 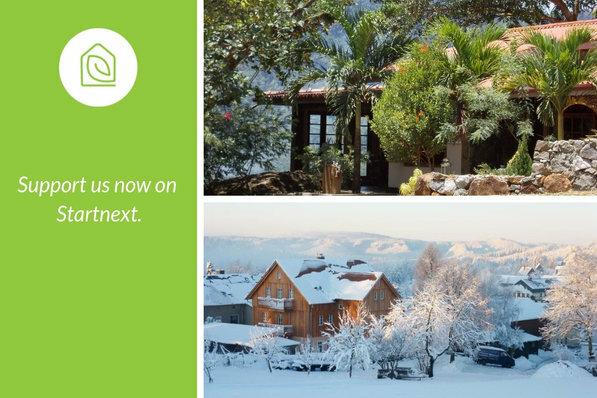 New sustainable holiday accommodations on bookitgreen: The integration of new hosts on bookitgreen is currently very time-consuming and we can hardly keep up with the many interested parties by checking and creating the advertisements. This is why it is so important that we simplify the creation process and that hosts can create their own advertisements. Then we "only" have to check whether the accommodation really fits to bookitgreen. Show reviews on the accommodations page: We already have many, consistently positive reviews, which unfortunately are not displayed. This is a technical challenge that we absolutely want to tackle this year. We are really looking forward to tackling these important points! The founding team consists of Phillip and me. Phillip is an expert in the technical field and responsible for the development of the platform. I, Moritz, currently do (almost) everything else. We get great support from our freelancer Marietta and our intern Almuth. Without these two I would be totally screwed. As a child I was on holiday every year with my big family on the organic farm Helchenhof. That was always great and remains in my very positive memory. After my studies, together with Phillip, I realized how difficult it is to find sustainable holiday accommodations and to book them online. The idea for bookitgreen was born! In addition to our team, two angel investors support us, who were part of the journey right from the start. They give us advice and support us as good as possible: Alfred is sustainable host of the Knoedl Alm and brings in the perspective of the hosts. Marc is a founder himself and before that was a lawyer in the management of large digital companies. Become part of our community and get once a month exclusive discounts on one special and sustainable holiday accommodation. Only you get these discounts - they are not publicly available. We start in May 2019 with the monthly discount campaigns. Your perfect travel companion is a jute bag. Make love #samebutgreen. The first 20 guys get a vegan einhorn condom in in addition to the travel companion for testing. Support your local tampon dealer. The first 20 girls get an organic tampon test pack from The Female Company in addition to their travel companion. Thanks to einhorn and TFC! For shipping outside Germany please add 8,70€ extra. 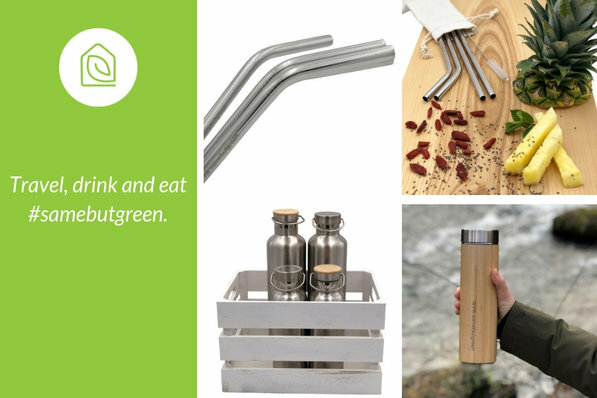 Perfect for home and travel: This set consists of four reusable stainless steel straws in a small linen bag with cleaning brush. Perfect for smoothies, cocktails, juices and of course just water. With drink samebutgreen engraved on every straw to inspire your sorroundings. For shipping outside Germany please add 8,70€ extra. Thanks a lot! Perfect for a sustainable short trip. You will receive a 10% discount on this voucher and we will send you your discount code by e-mail. Since our commission is 10% of the travel value, the voucher can only be redeemed from 250€ travel expenses. The perfect "Lunchbox", which is also great for all other types of food. Super suitable for a nice excursion into nature or as a lunchbox in school or at work. A small silicone ring keeps the box completely sealed. Eat #samebutgreen from now on. For shipping outside Germany please add 8,70€ extra. Thank you very much! For the small thirst: 0.5 litre capacity - sufficient for a short run or a trip into nature. Thanks to insulation, your drinks stay cold for up to 12 hours and warm for up to 6 hours. Drink samebutgreen from now on. For the tea lovers among you. Thanks to insulation, your drinks will stay warm or cold for up to 12 hours. The integrated tea strainer can be filled with loose tea. Of course you can also fill the bottle with coffee or other drinks. Drink your tea from now on samebutgreen. For the big thirst: 1 litre capacity - perfect for a day trip into nature. Thanks to insulation, your drinks stay cold for up to 12 hours and warm for up to 6 hours. Perfect for your next sustainable holiday. You get 10% discount on this voucher and we will send you your discount code by email. Since our commission is 10% of the travel value, the voucher can only be redeemed from 500€ travel expenses. A beautiful grey organic cotton (80%) and recycled polyester (20%) hoodie with the bookitgreen logo as screen print. Perfect for everyday use and already part of our (almost) daily outfit. On the back it says in beautiful writing: Next time you travel, bookitgreen. Everything we have to offer for a sustainable journey. One week vacation in the small flat on Ruegen for two people. This trip would normally cost 280€. A great discount for you and the whole sum goes to bookitgreen. Thank you very much, Roswitha, for this great reward! Vacation time in low season (March, April, November and December) depending on availability. This reward does not expire. These vouchers can be used for a holiday between Sunday and Friday at the Bohemian Cottage. A great discount for you and all your income goes to bookitgreen. Thank you very much, Ales, for this great reward! Redeemable upon availability. This reward does not expire. One week in the flat Ponyhof for two adults and one child on the Bio Erlebnishof Grittel. This trip would normally cost 525€. A great discount for you and the whole sum goes to bookitgreen. Thank you very much, Nicole, for this great reward! Vacation time in low season (outside of German school vacation times and Christmas/New Year) depending on availability. This reward does not expire. 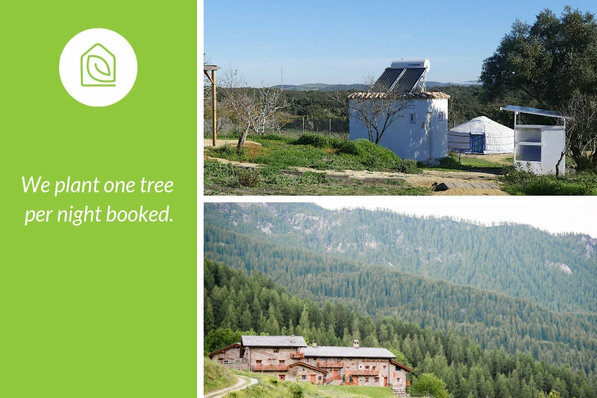 One week vacation in a yurt in Spain at Casa De La Alegria for two people. This trip would normally cost 500€. A great discount for you and the whole sum goes to bookitgreen. Thank you very much, Bea and Knut, for this great reward! Vacation time depending on availability. This reward does not expire. Four nights for two people in the Rose Suite of the Green Key certified Colina Flora Eco-friendly Guest House with organic breakfast (vegan/vegetarian). This trip actually costs 500€. A super discount for you and the whole income goes to bookitgreen. Thank you very much, Aasta, for this great reward! Vacation time after arrangement and availability in the low season (01.11.-31.03.). This thank you does not expire. 2 weeks vacation in Saxon Switzerland in the Viabono certified accommodation Winterberg Blick for up to 4 people. This trip would normally cost 1.410€. A great discount for you and the whole sum goes to bookitgreen. Thank you very much, Monika, for this great reward! Vacation time in February, March, November or in the beginning of December - depending on availability. This reward does not expire. Five days in the flat Family for up to 6 people on the Bio Erlebnishof Grittel. This trip would normally cost 700€. A great discount for you and the whole sum goes to bookitgreen. A great holiday with 6 nights for 2 persons with full board in the Tea Garden Bungalow of the Singharaja Garden AGRO & ECO-lodge on Sri Lanka. This trip would normally cost 1.020€. A great discount for you and the whole sum goes to bookitgreen. Thank you very much, Alfons, for this great reward! One week vacation in the multiple times awarded Janbeck's FAIRhaus in the apartment "Wolken" for up to 4 persons in high season. This trip would normally cost 1.120€. A great discount for you and the whole sum goes to bookitgreen. Thank you very much, Uta, for this great reward! One week vacation for up to 9 persons on the 230 years old, beautiful and lastingly reorganized Holunderhof. This trip would normally cost between 1.190€ and 1.680€. A great discount for you and the whole sum goes to bookitgreen. Thank you very much, Sabine, for this great reward! With bookitgreen we were part of the Axel Springer Plug and Play Accelerator's, were supported by Power to idea and made it to the first stage of the Climate KIC Accelerator. A great support for the start! Utopia fits our vision perfectly and our cooperation goes so far that you can now find bookitgreen under "Service" on the homepage. We have a lot more planned for the future. Thank you very much for your support! We were supported by the IBB through the programme for innovation assistants, by the Vienna Business Agency for Social Entrepreneurship and by the FFG through the AT:net grant.